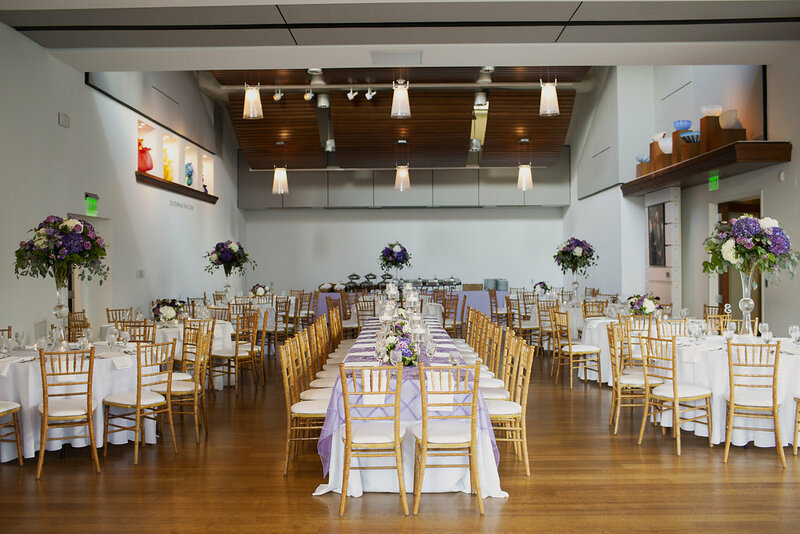 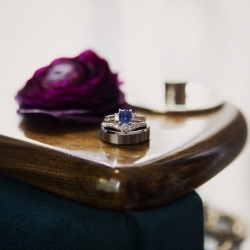 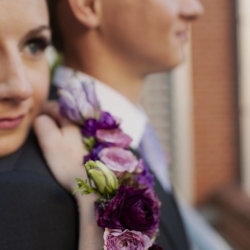 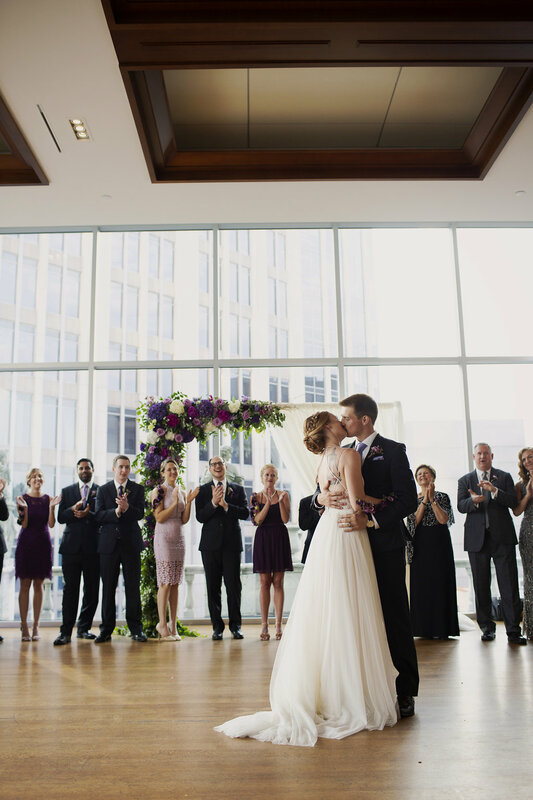 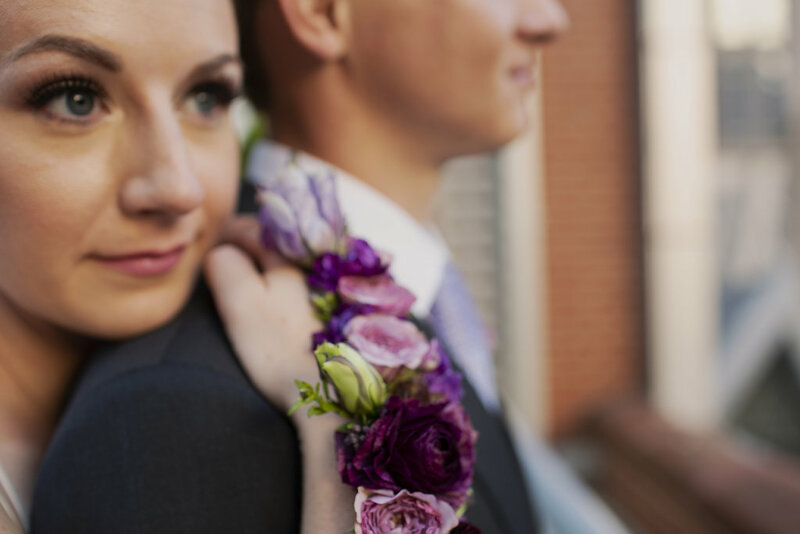 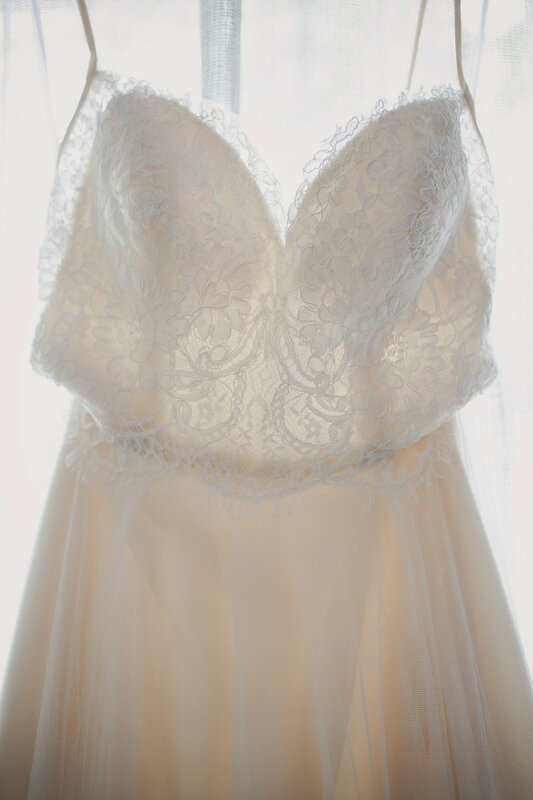 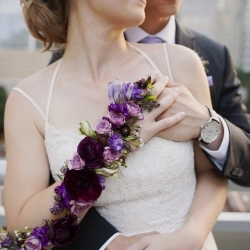 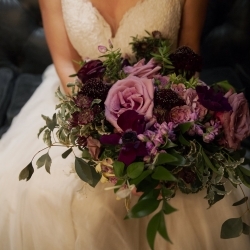 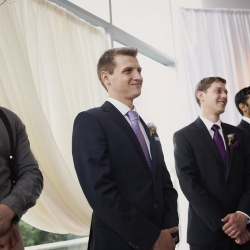 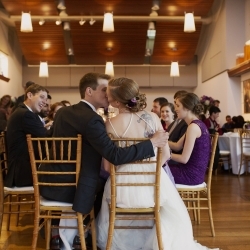 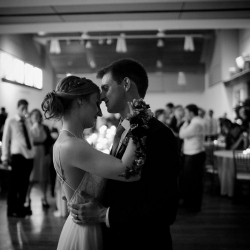 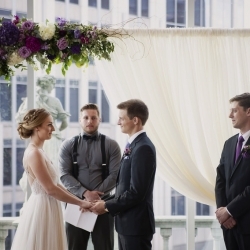 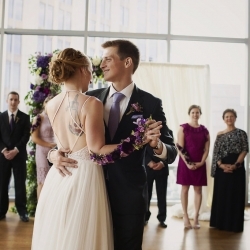 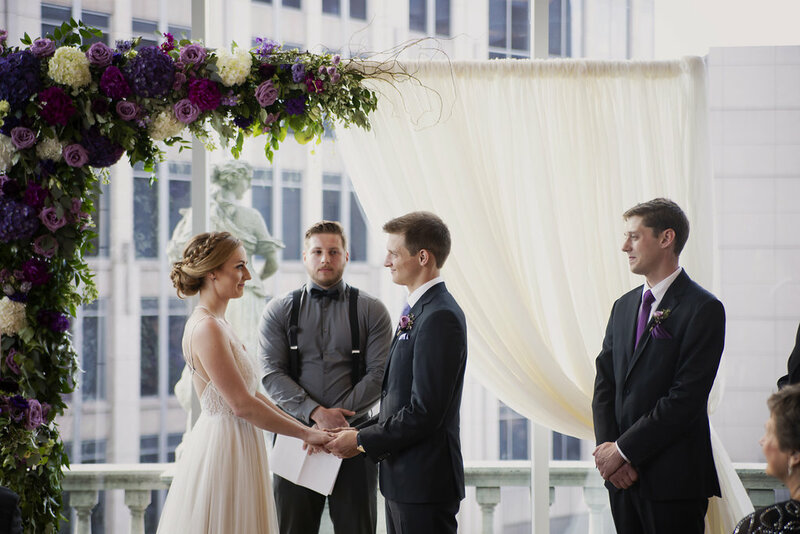 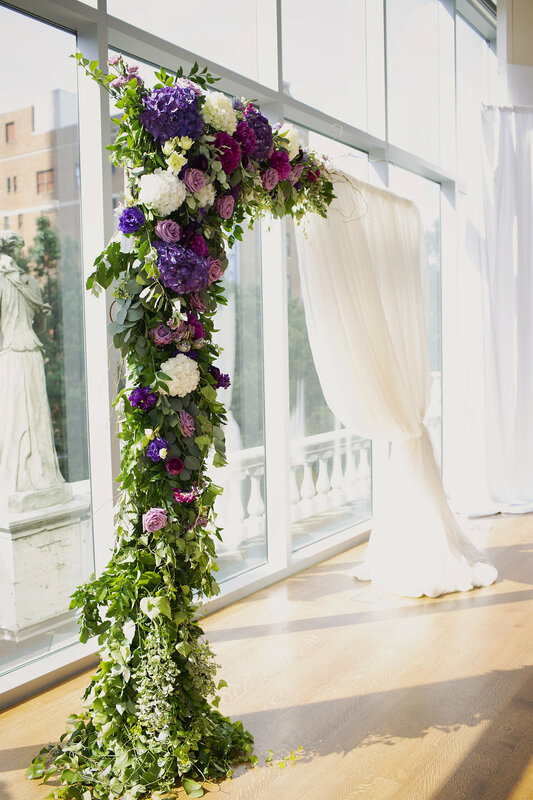 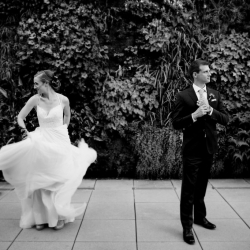 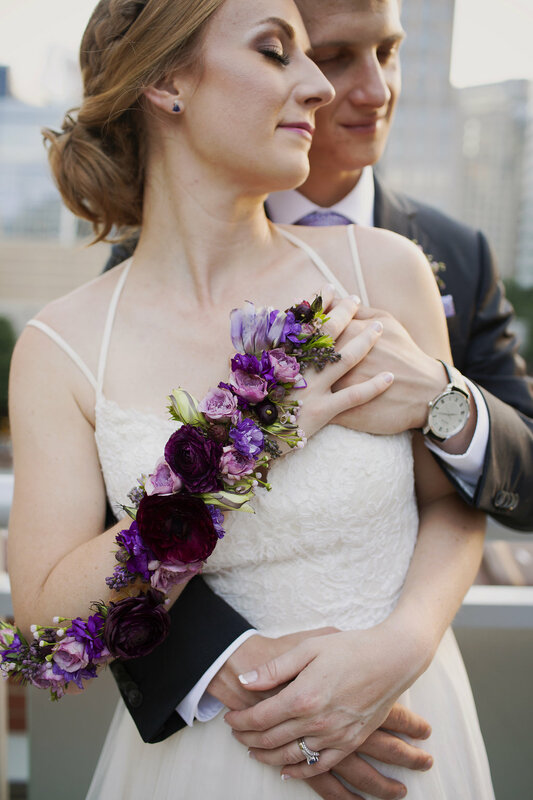 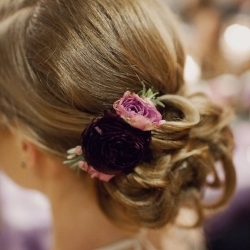 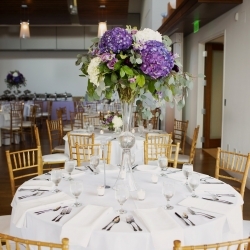 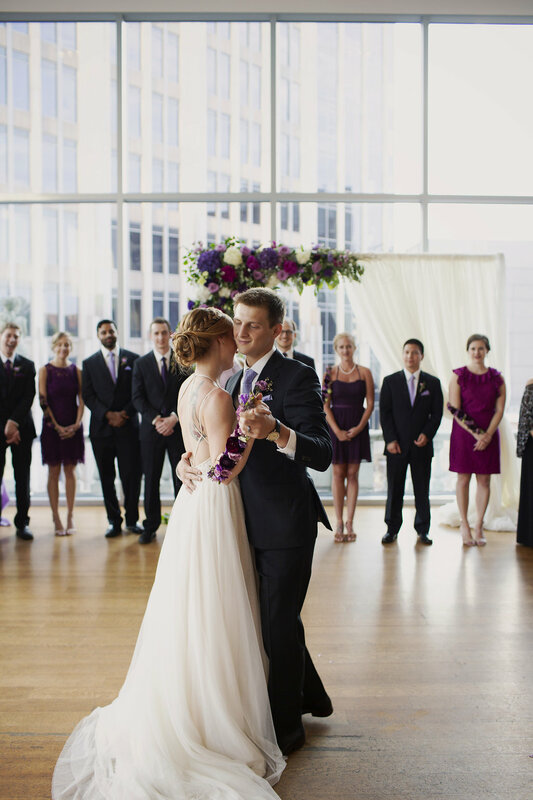 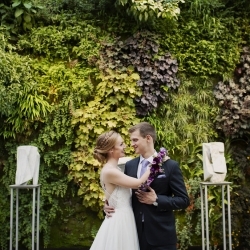 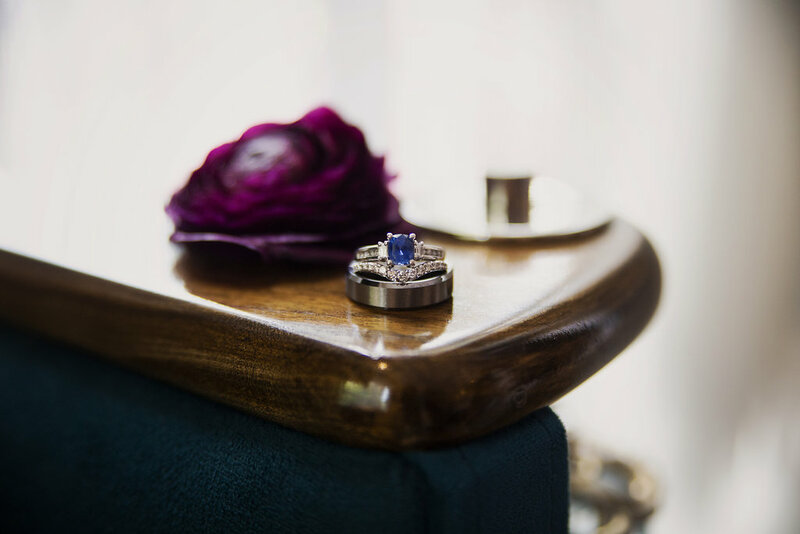 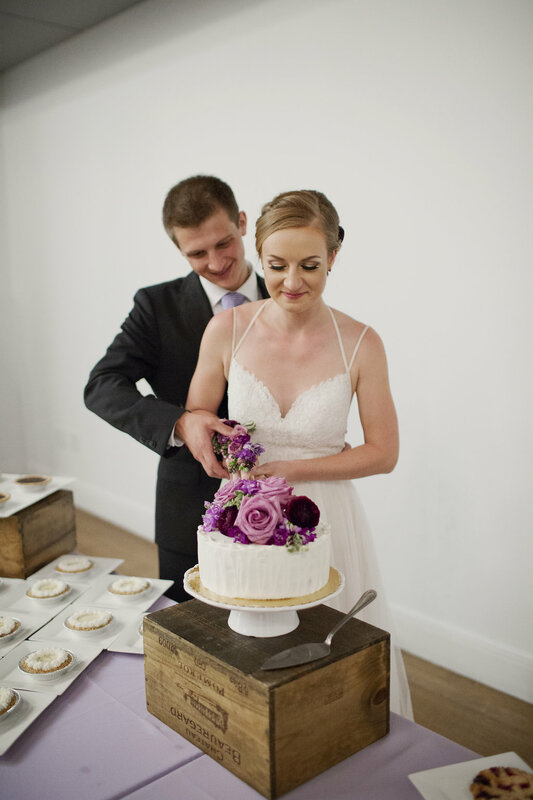 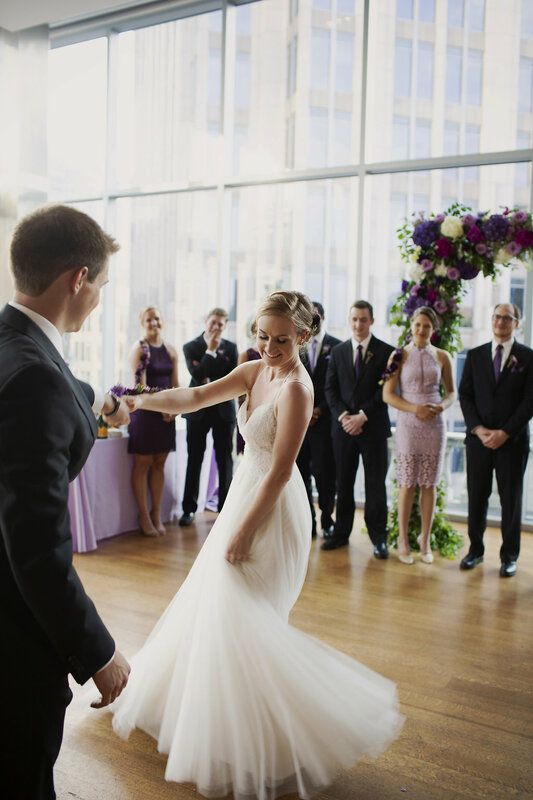 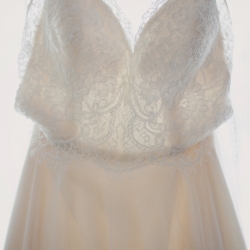 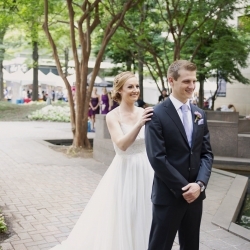 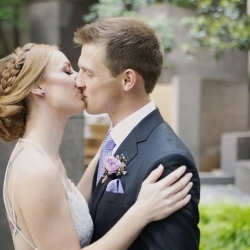 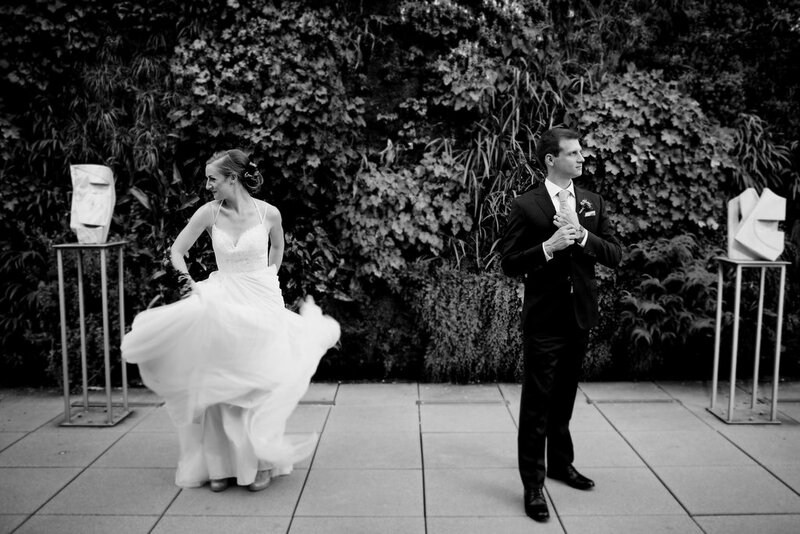 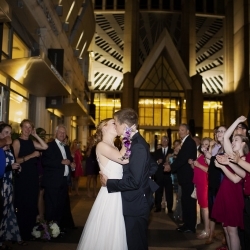 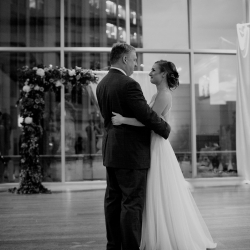 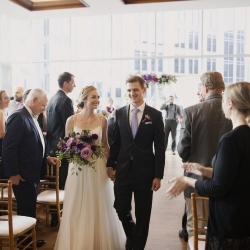 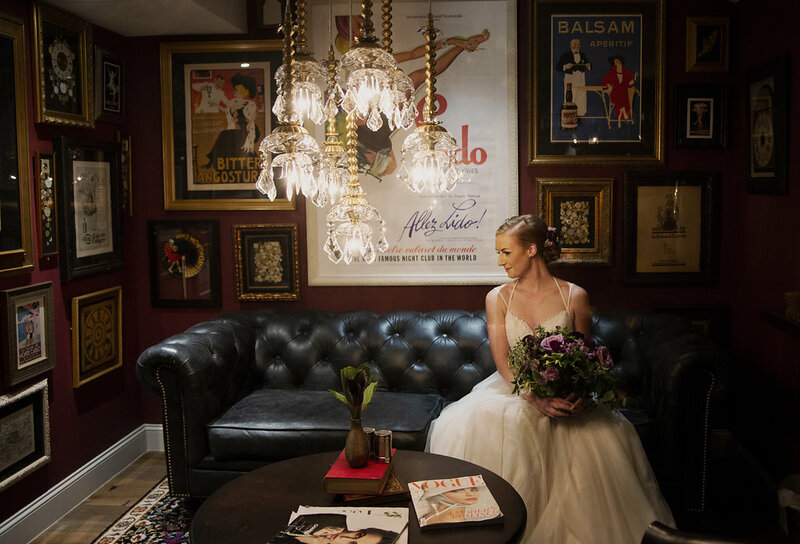 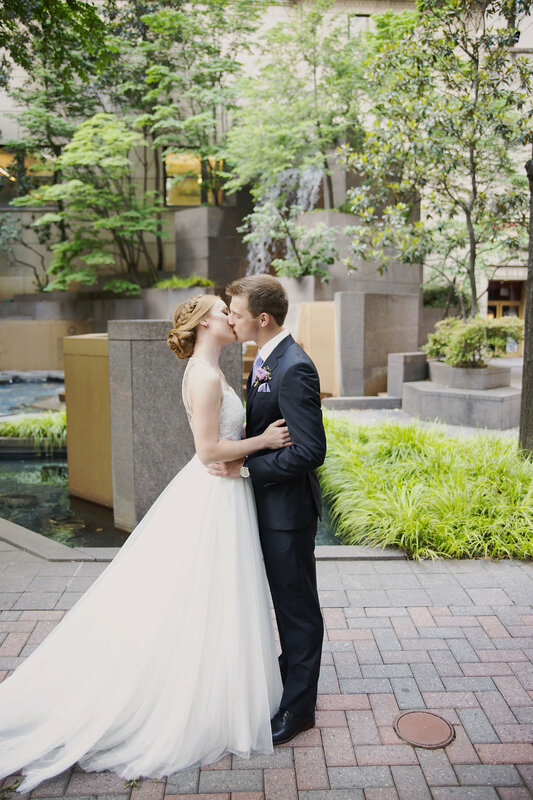 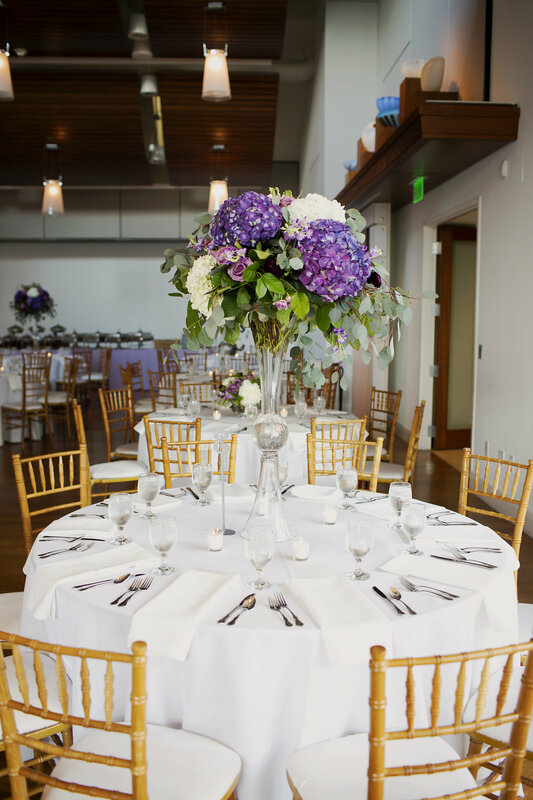 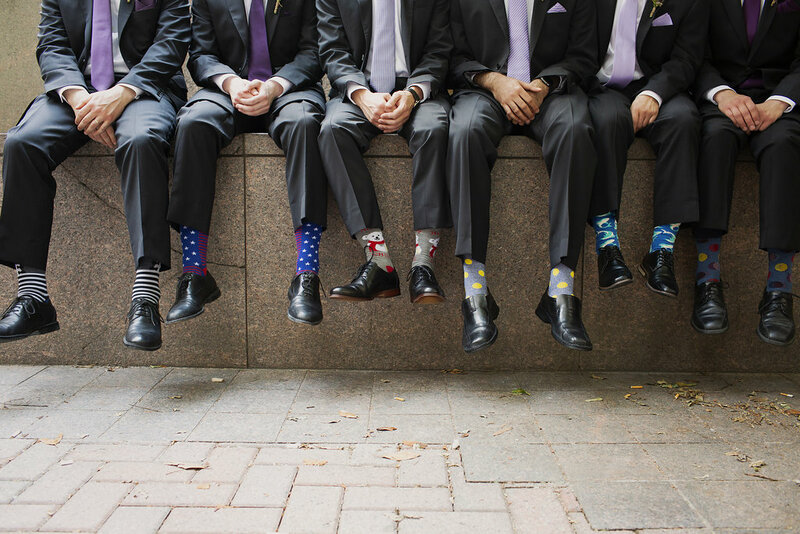 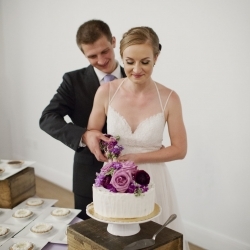 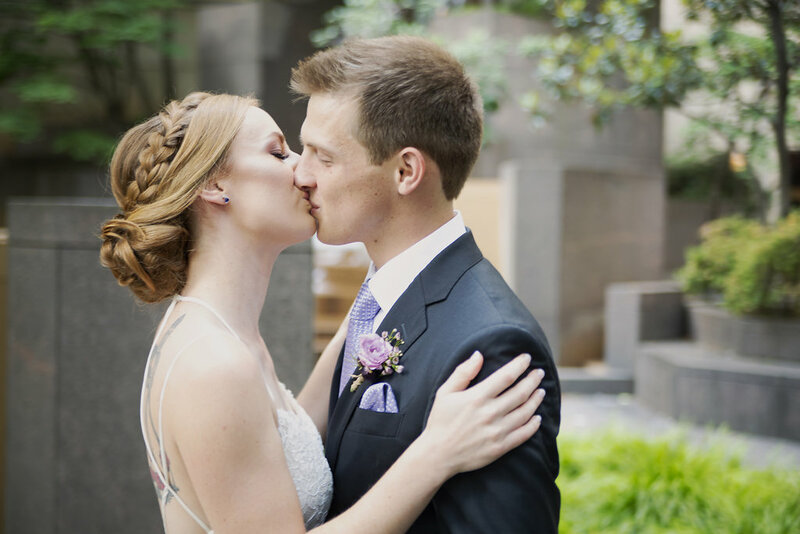 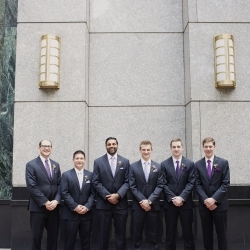 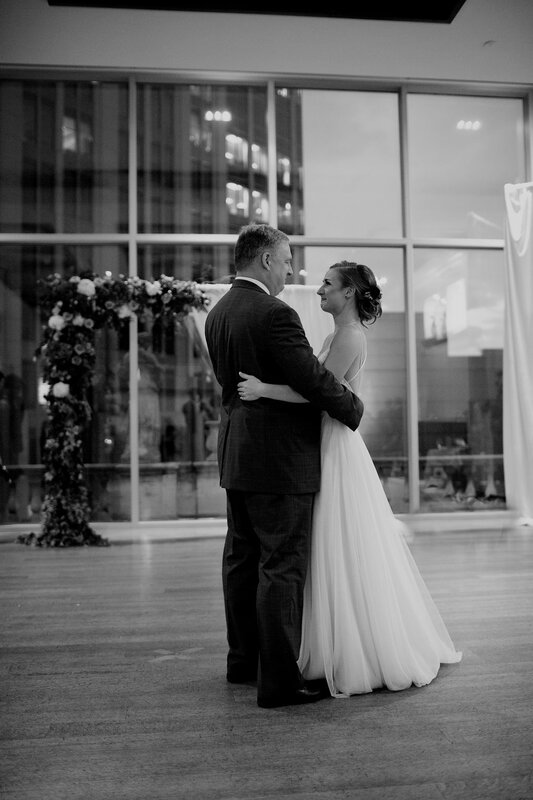 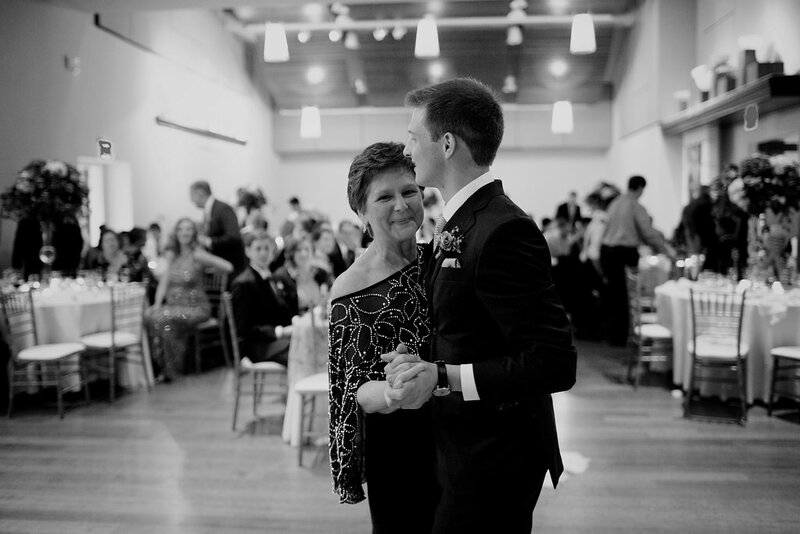 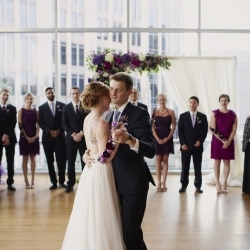 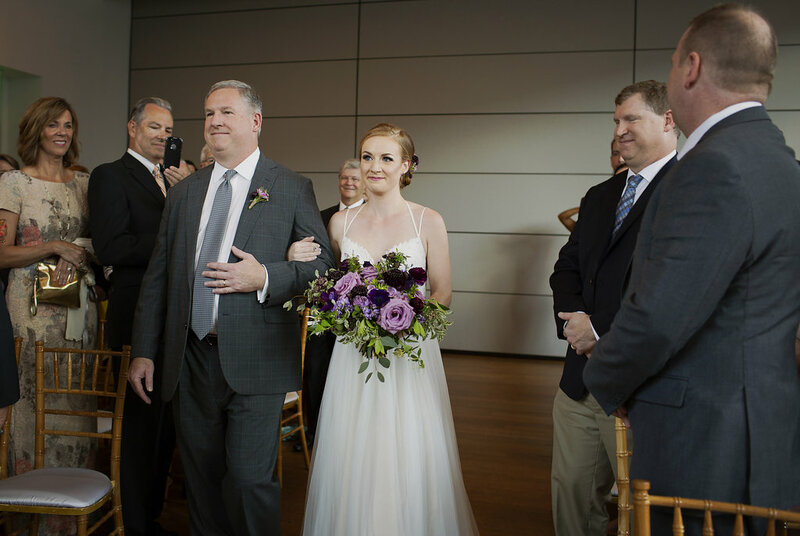 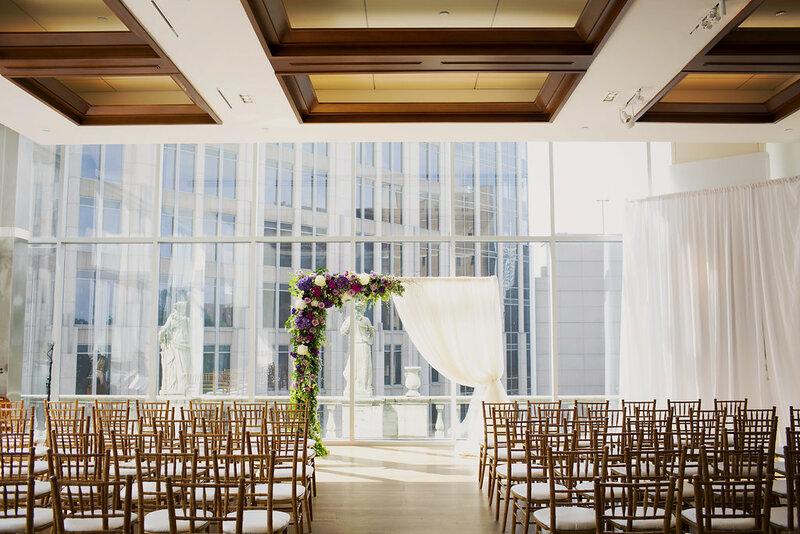 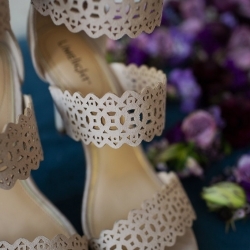 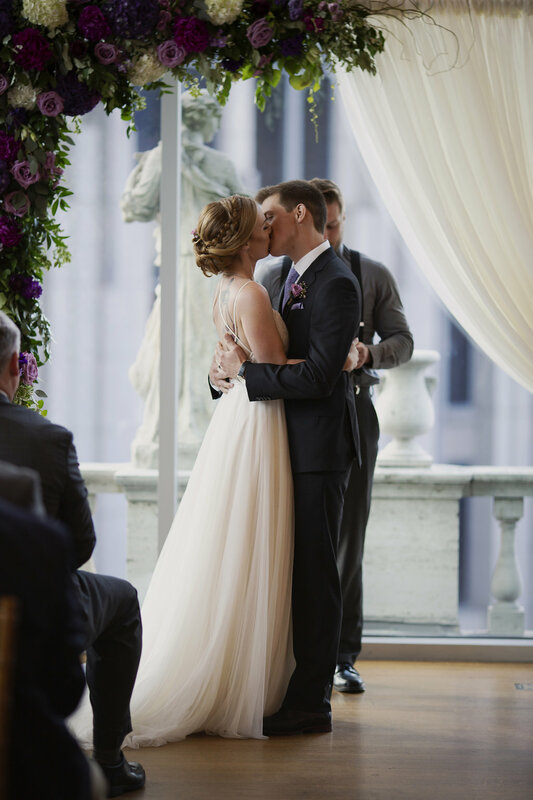 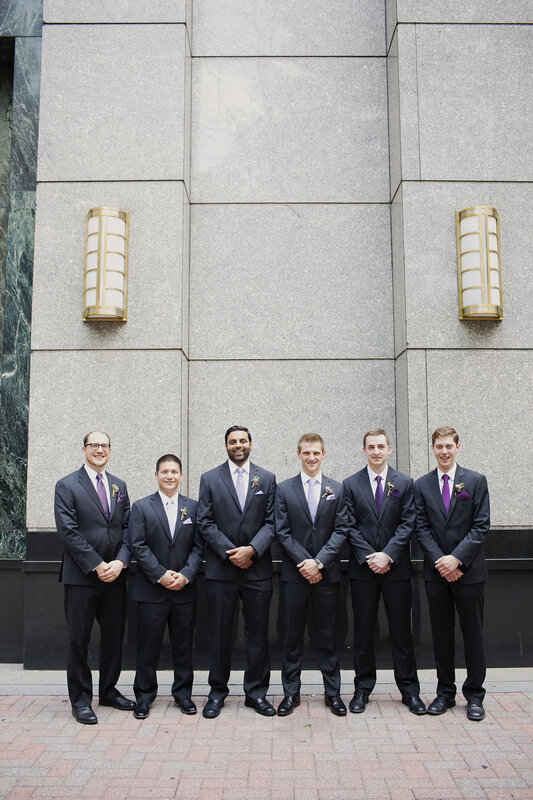 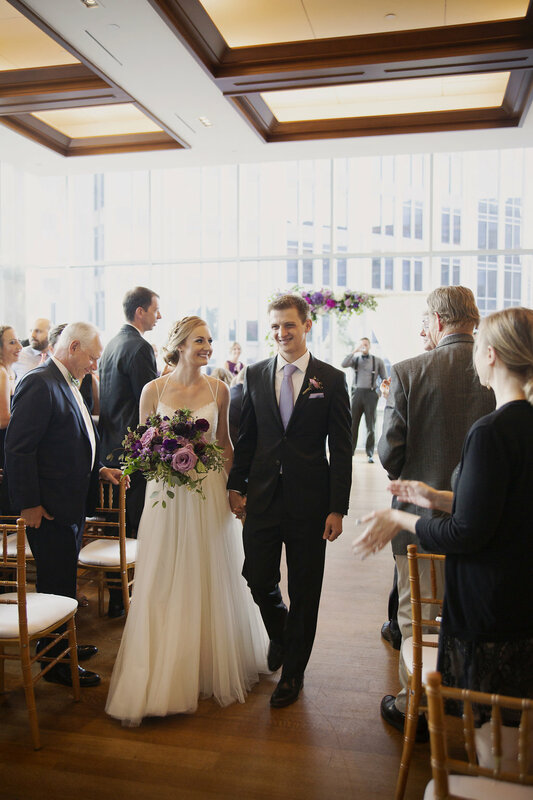 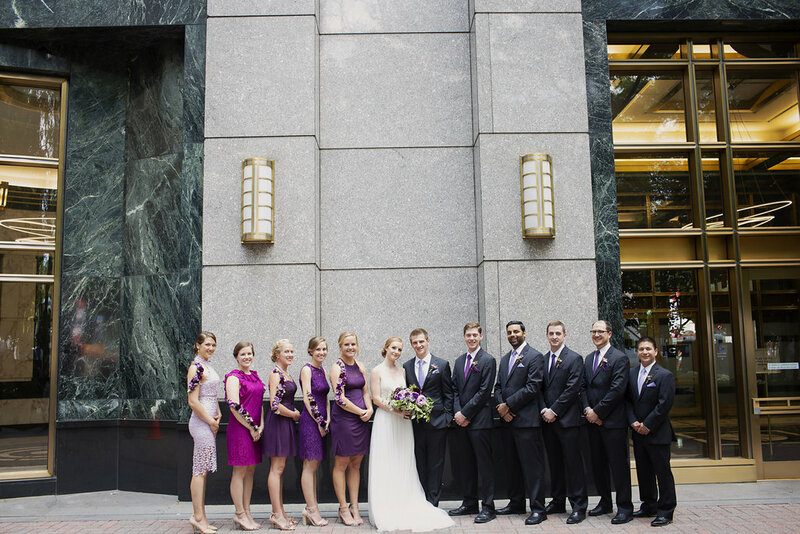 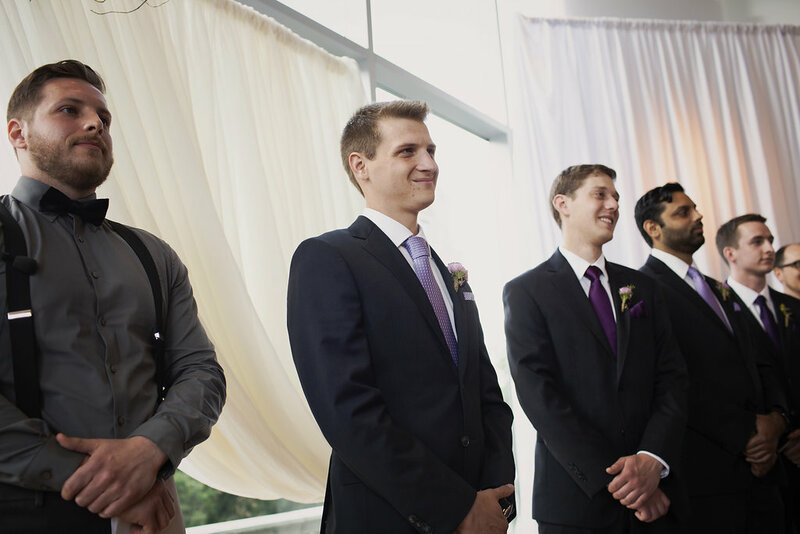 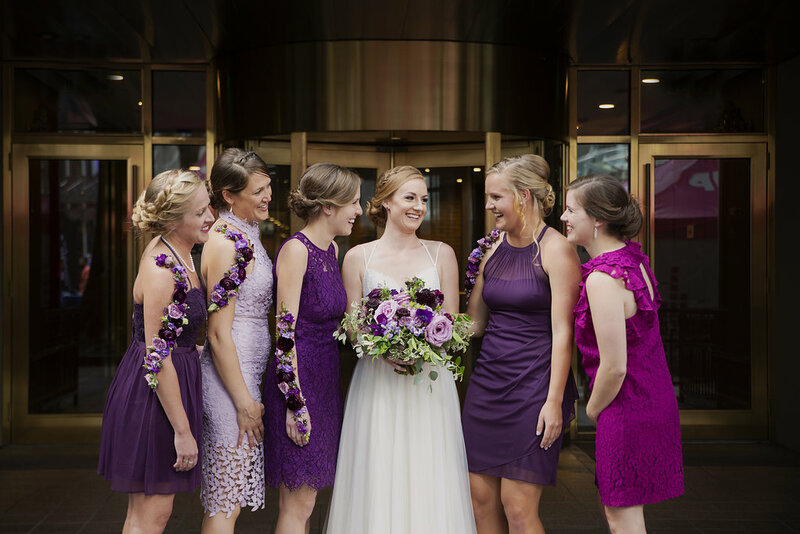 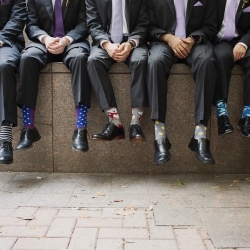 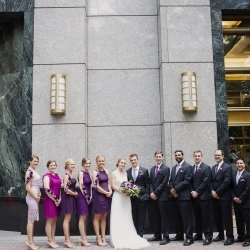 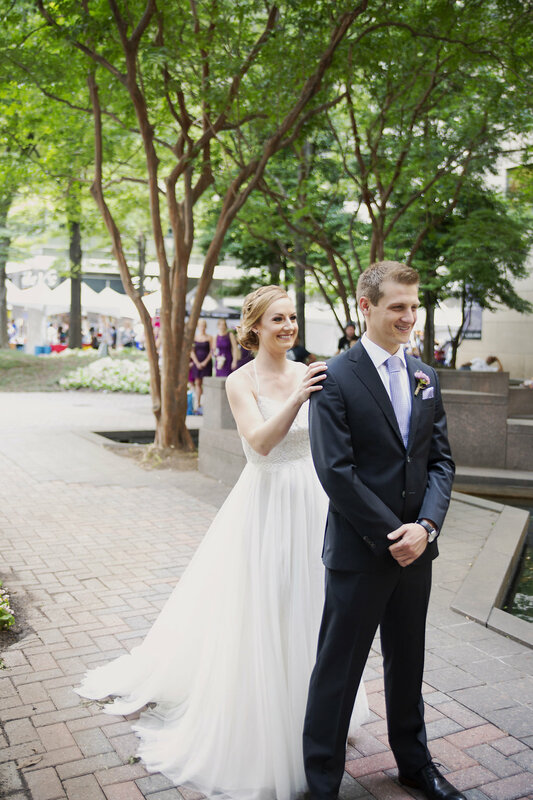 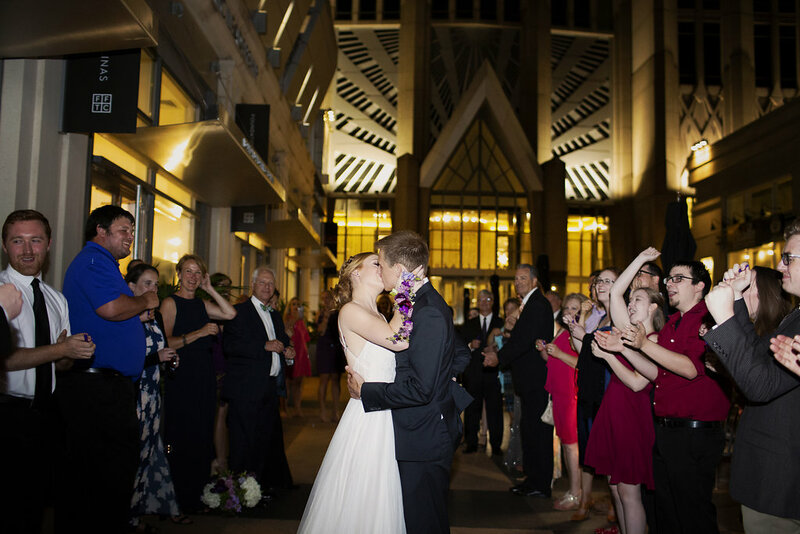 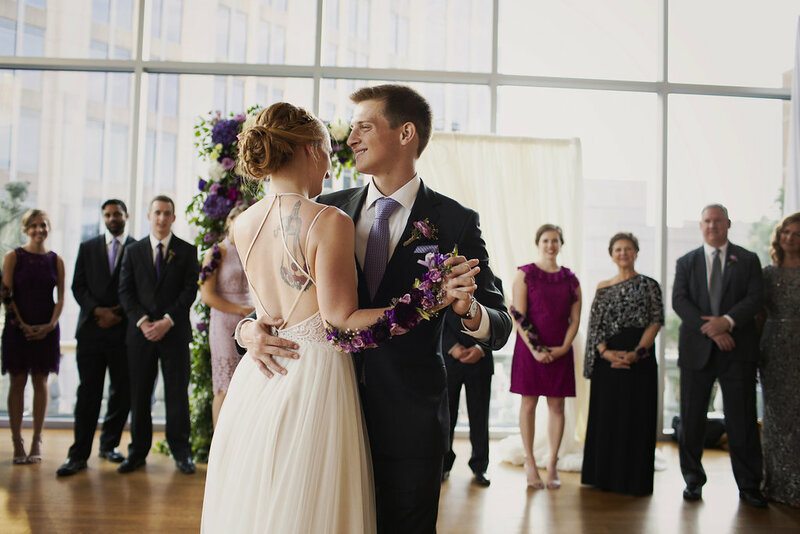 Anna and Greg were married at the Foundation for the Carolinas in Uptown Charlotte, NC. 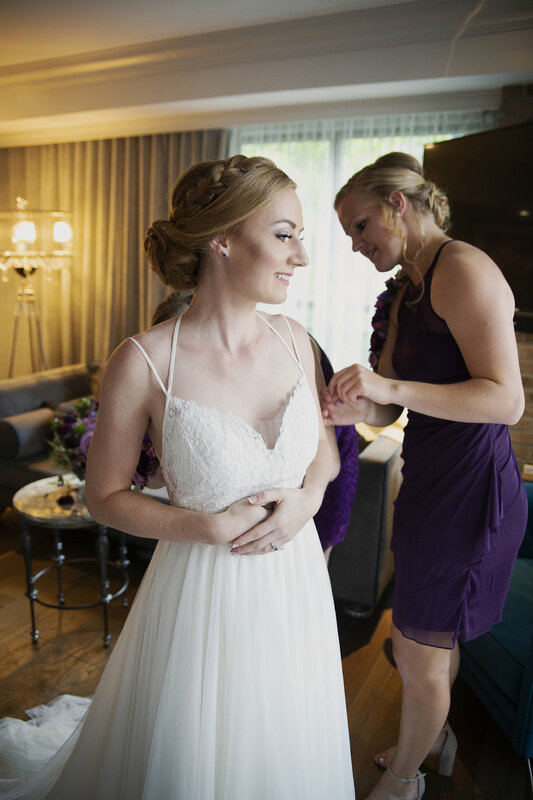 The girls got ready at the gorgeous The Ivey’s Hotel. 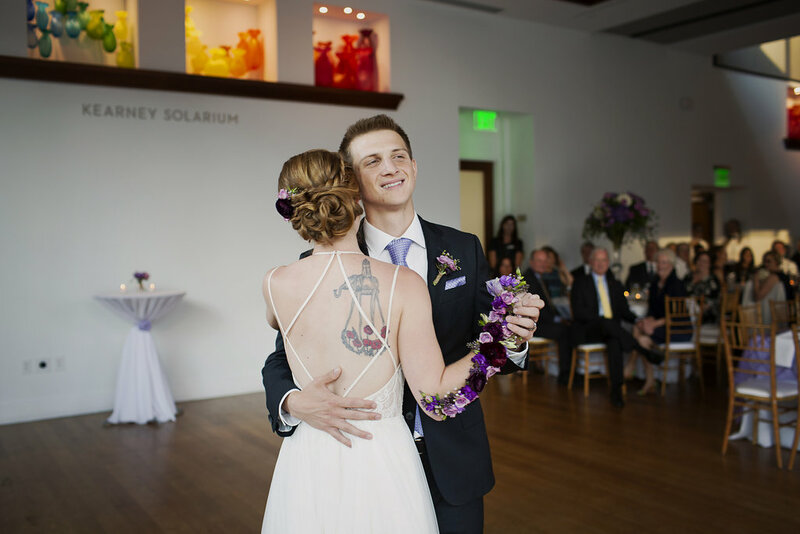 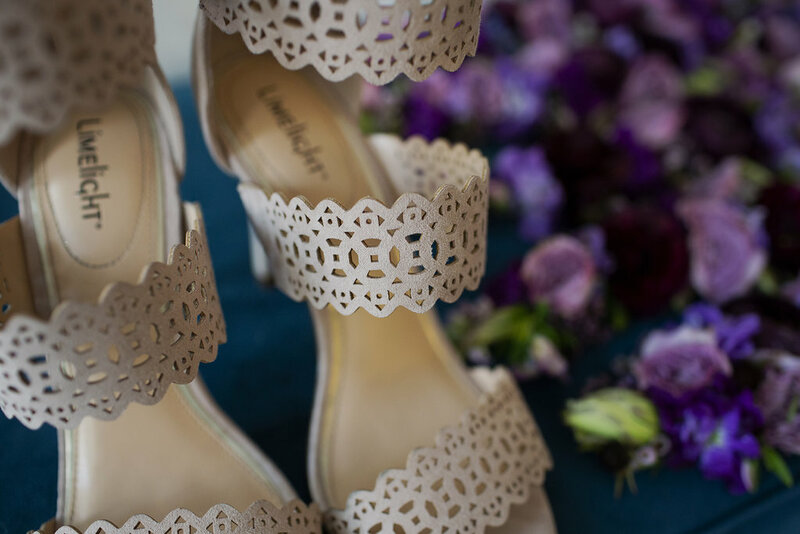 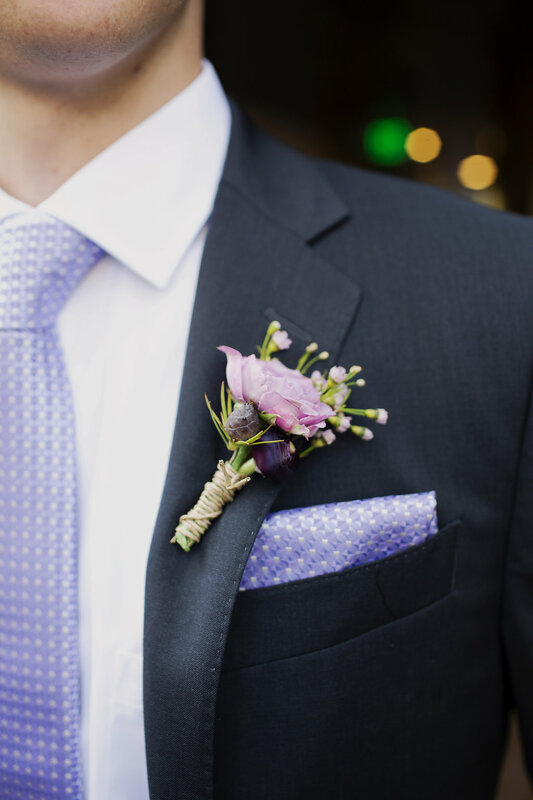 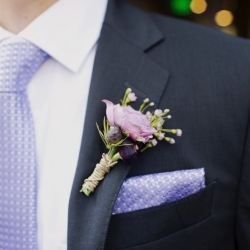 But the best thing about this wedding was the floral tattoos! 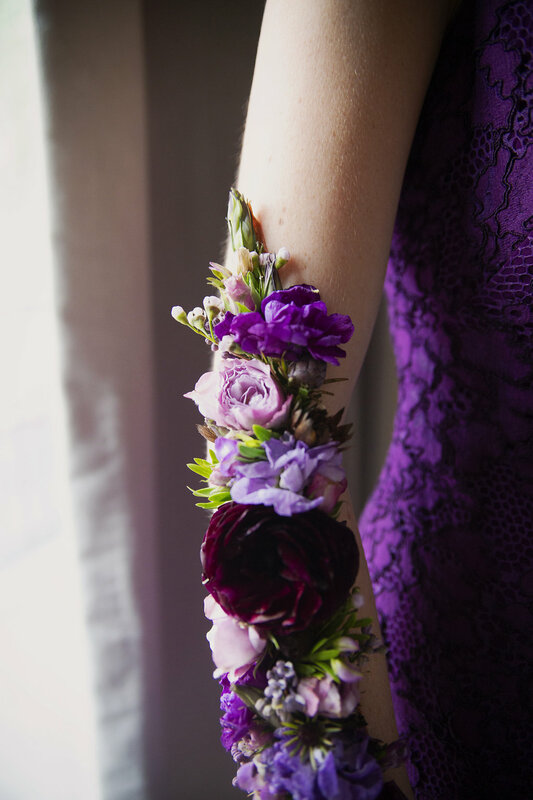 And yes, the flowers on them are real! 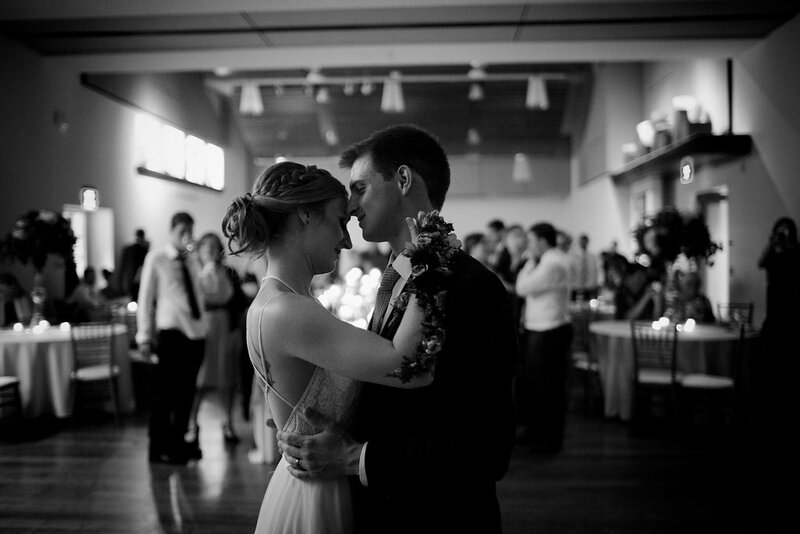 Anna and Greg met at work training and they are both accountants. 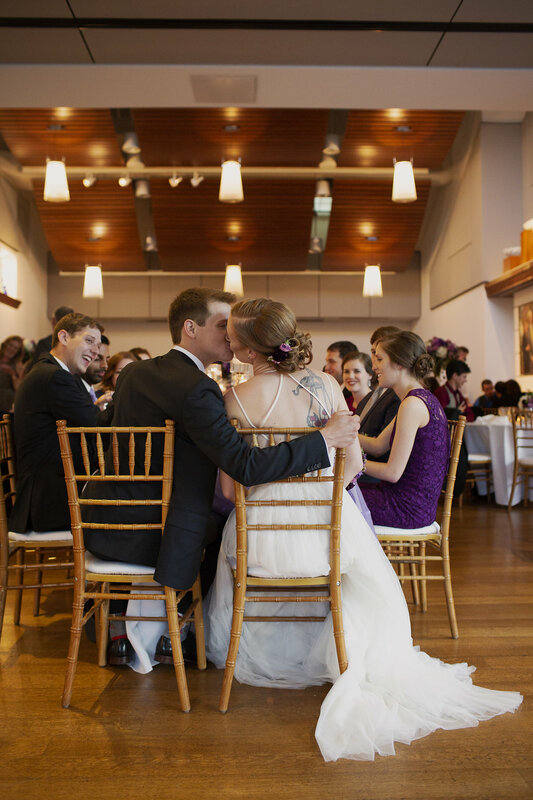 They have a cat named Dante and a dog named Izzy. 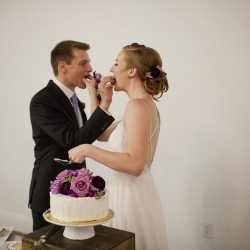 They are a super sweet couple who like to have fun together. 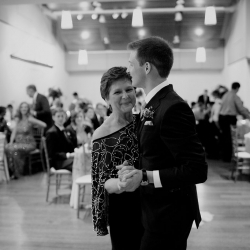 And their families are the best! 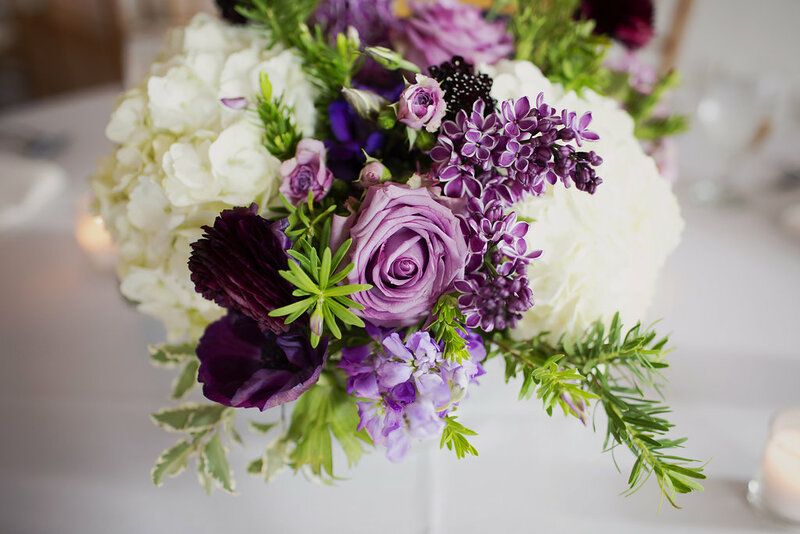 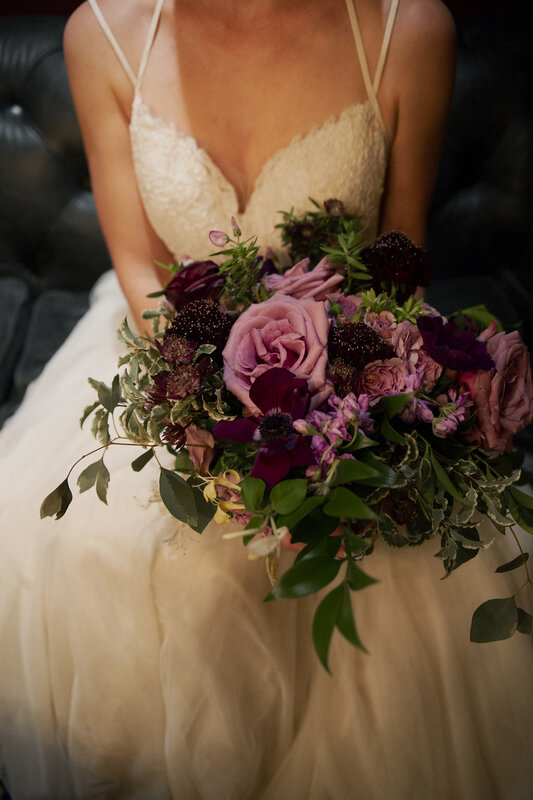 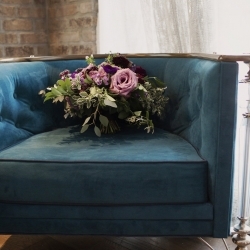 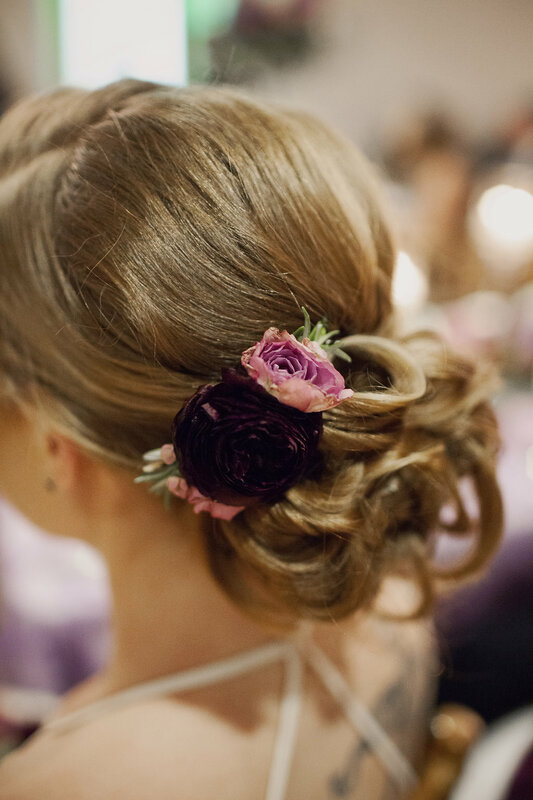 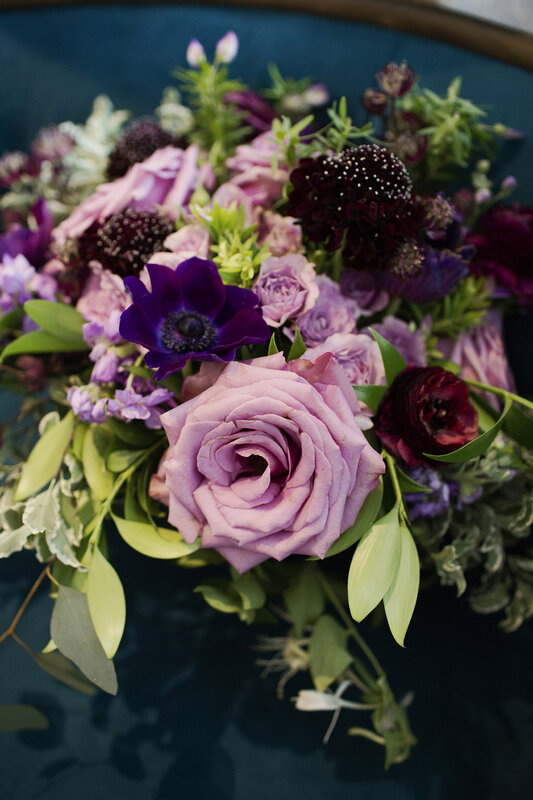 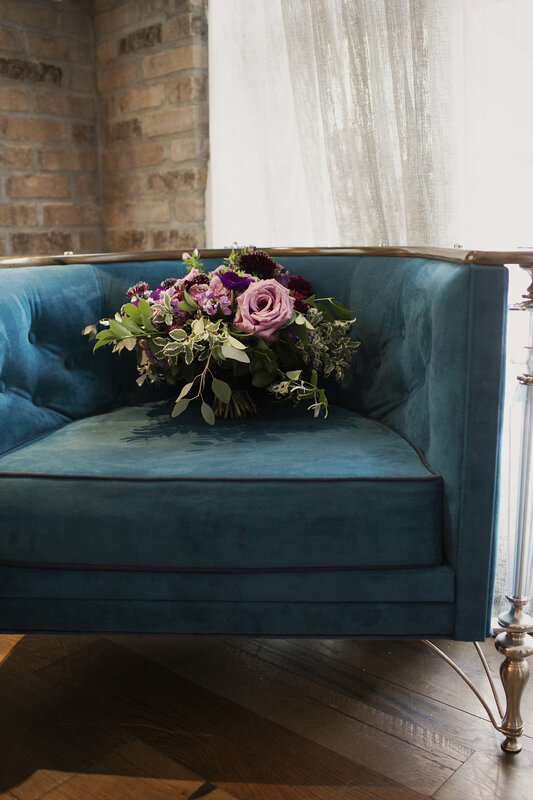 When we first met with Melissa from What’s Up Buttercup to go over the purple that Anna wanted to incorporate, Melissa asked if she wanted to do something new. 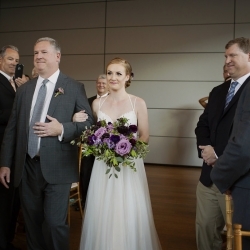 Anna was on board! 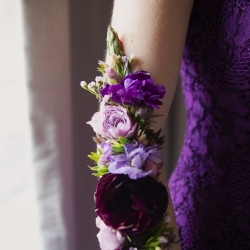 The girls wore floral tattoos on their arms instead of carrying bouquets. 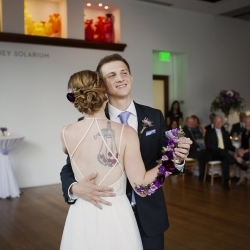 Anna had one of each, a bouquet for the ceremony and a floral tattoo for the reception. 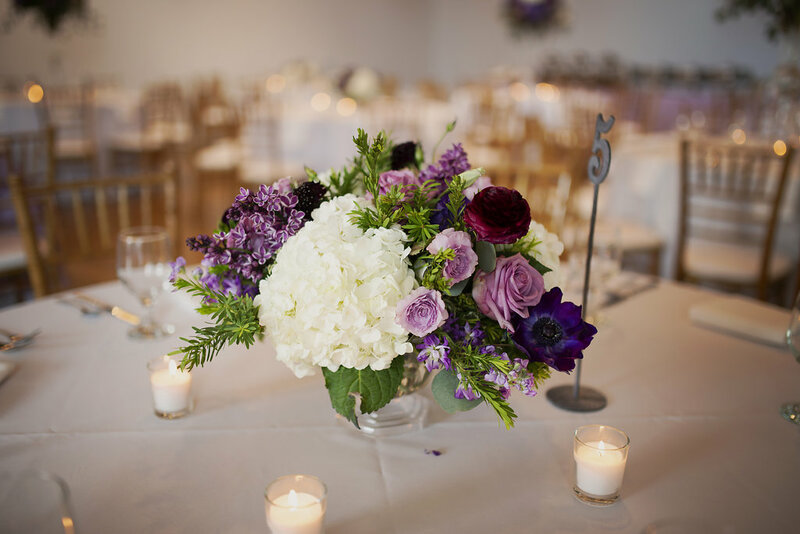 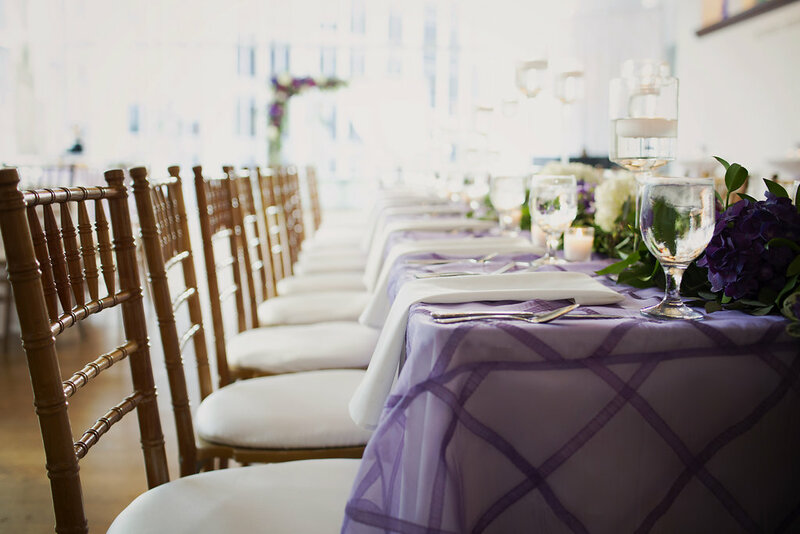 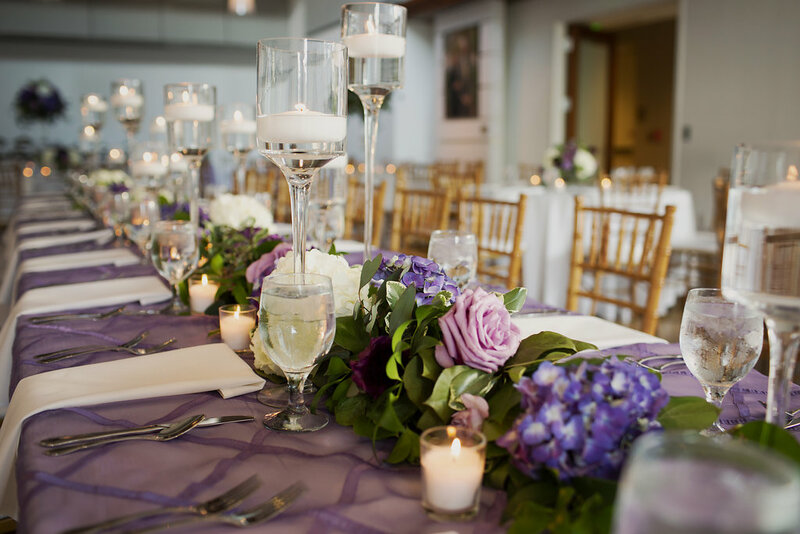 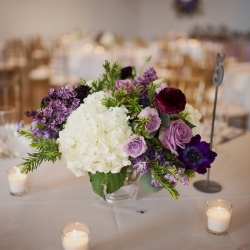 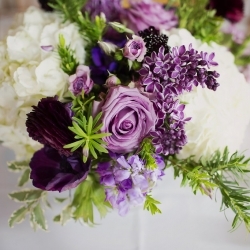 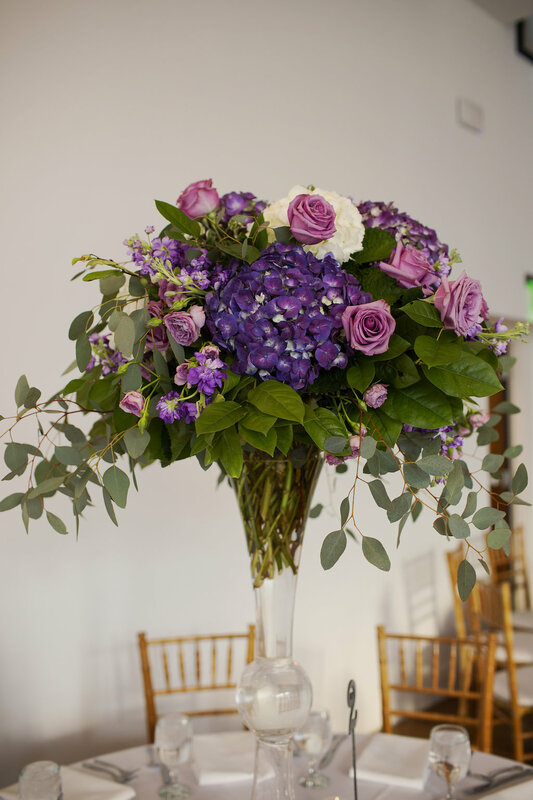 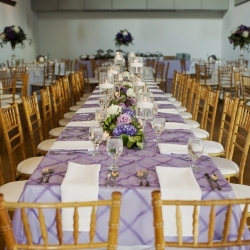 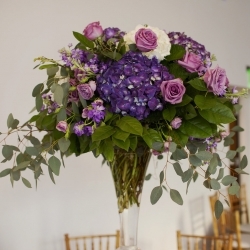 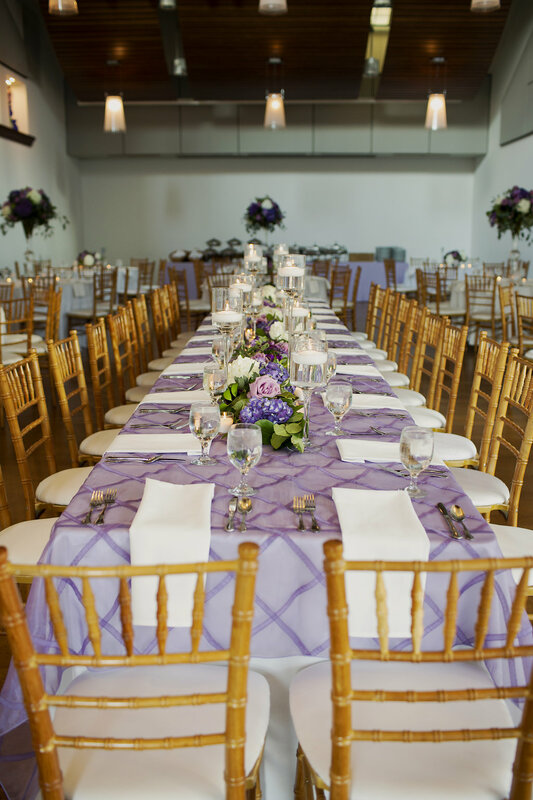 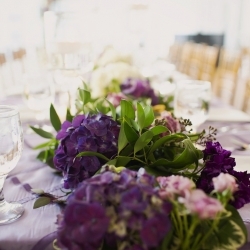 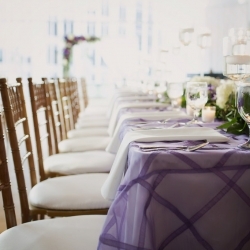 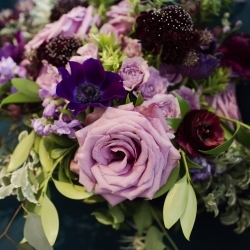 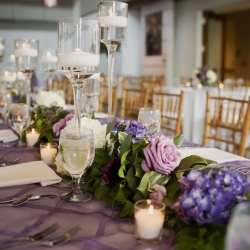 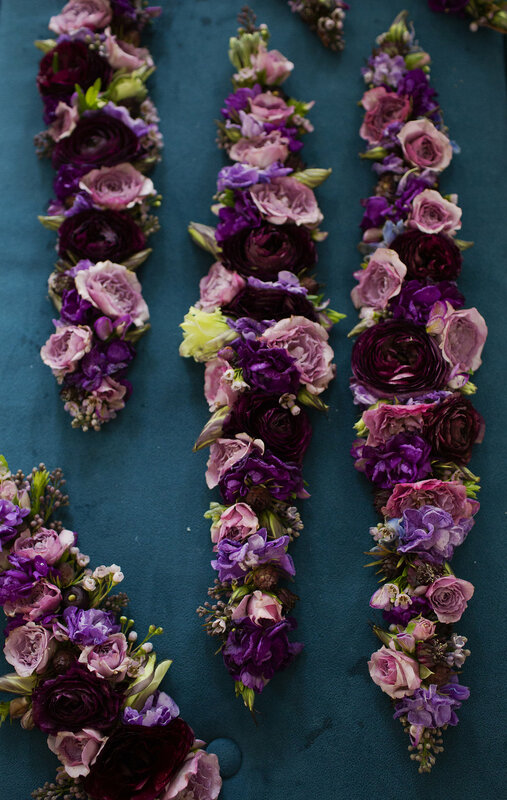 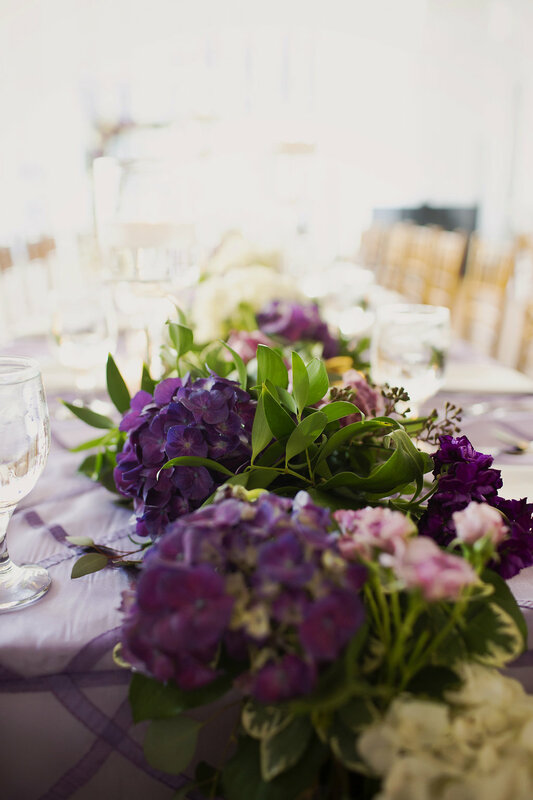 We kept her purple theme classy with touches in the florals and on the head table. 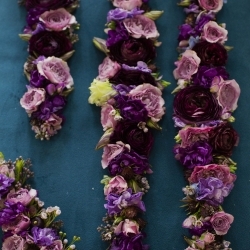 Anna and her Mom wanted flowers everywhere! 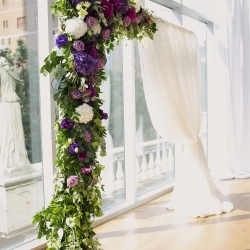 Most of the decoration budget went to the florals, which was exactly what they wanted. 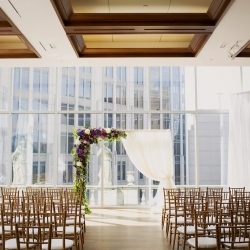 They had a first look photo session, to help calm their nerves and a gorgeous backdrop for the ceremony against the windows in the Foundation for the Carolinas. 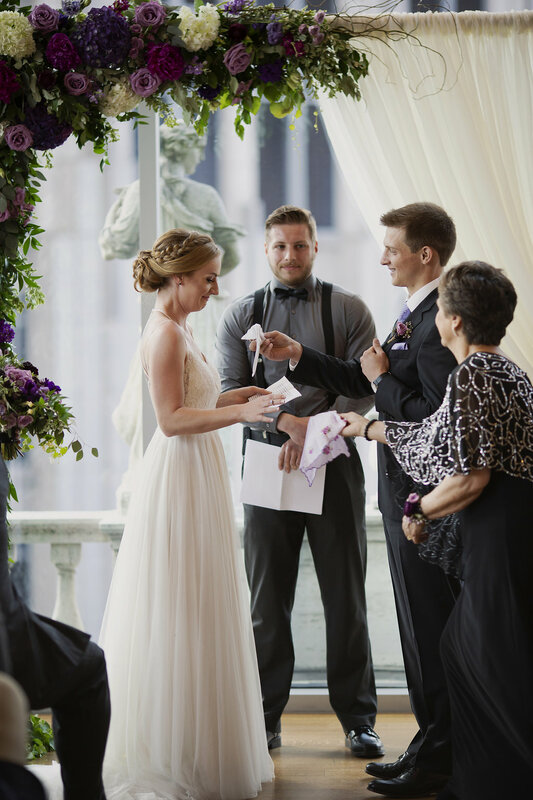 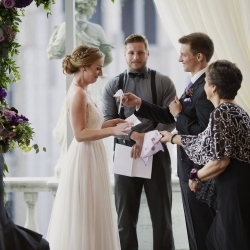 They wrote their own vows and they were full of love and excitement. 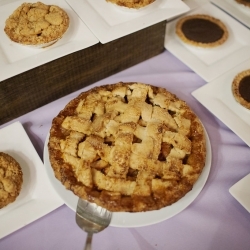 They love Carolina Pie Company and we used mini pies as the favors (although the guests broke into them early!). 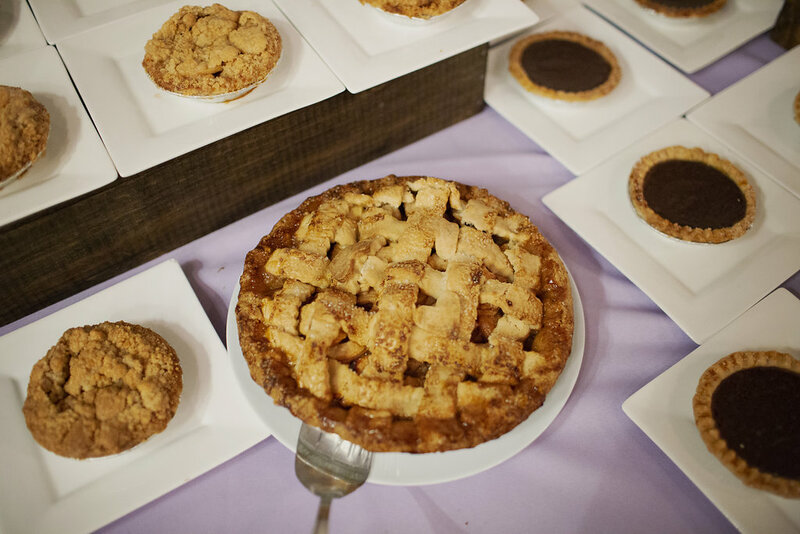 And for good reason – those pies are amazing! 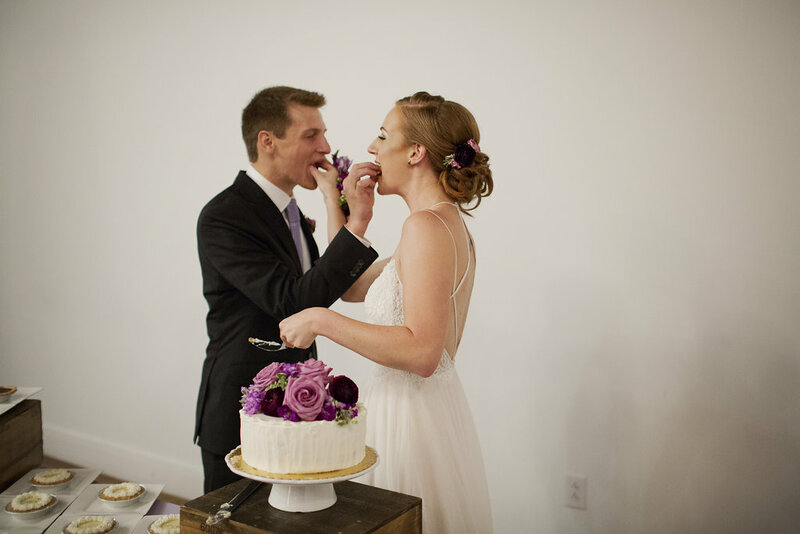 Of course, I saved them 2 of their favorites to enjoy later. 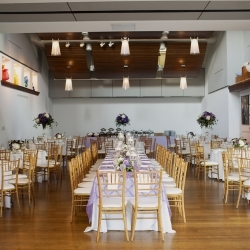 Best Impressions was the caterer and they always have the best gnocchi. 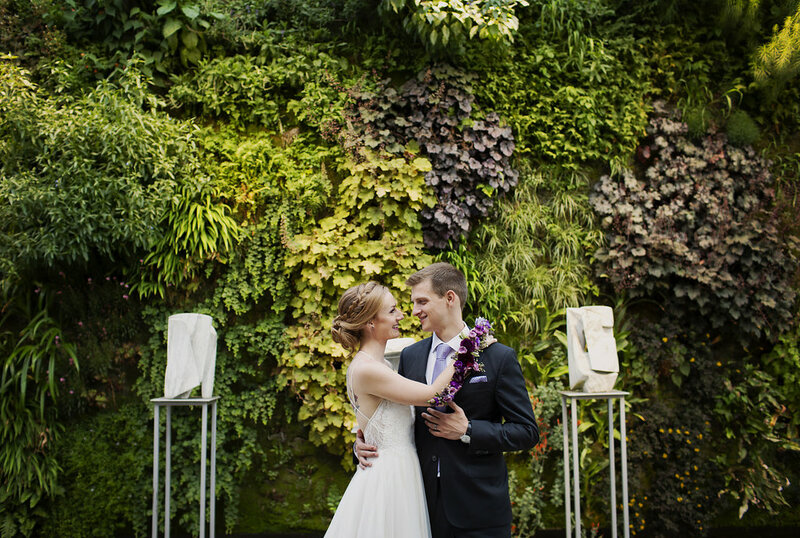 Anna and Greg, I wish you many travels together for the years to come!